Opening its doors just three days after prohibition was repealed in 1933, the All-American Rathskeller is the longest continually operating bar in Pennsylvania. A true staple of the State College and Penn State community, the Rathskeller’s comprehensive history is perhaps the most important part of its identity today. On November 6, 1933, Prohibition was repealed. A State College resident, “Pop” Flood, owner of the Greenroom Restaurant, saw the perfect opportunity to expand his business. 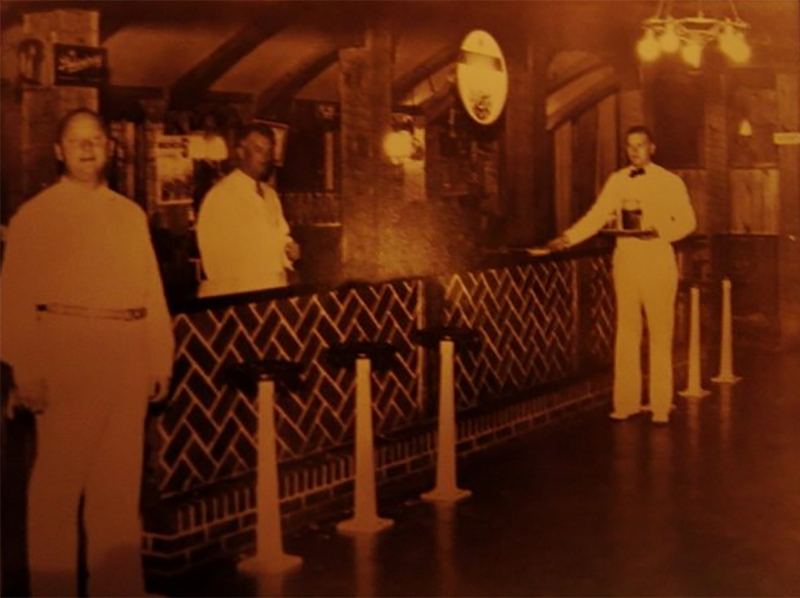 Three days later, on November 9, 1933, “The Rathskeller & Gardens” opened for business, becoming the fourth, oldest licensed bar in the state. At this time, no liquor was sold anywhere in State College, and according to the law, only beer was allowed to be sold in public taverns. 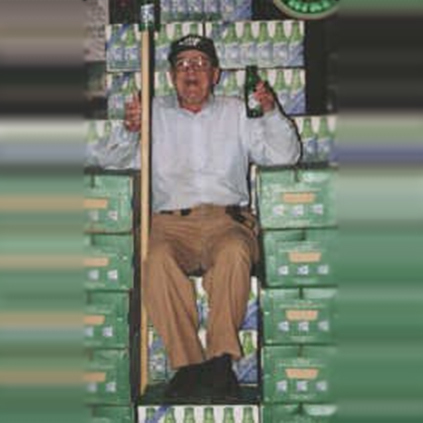 Also during this period, Rolling Rock got its start in Latrobe, Pa.. “Pop” thought it was a logical choice to bring together a local pub with a local beer, and so began the tradition of rock ponies at the Skeller. A year after giving birth to the “Rathskeller & Gardens”, the Floods decided to turn their full attention to the Green Room Restaurant. So in 1934, C.C. “Doggie” Alexander bought the bar, and changed the name to the “All American Rathskeller”. The 1940′s saw the arrival of two of the most famous “Skeller Rats” of all time. Spider, the ever-smiling cook, and without a doubt, the most famous “Skeller Rat” of all time, Harry Neideigh. Spider first introduced the Reuben to State College, and also started his own creation, the “Spider” burger, loaded with swiss cheese and grilled onions. Both of these tasty items still appear on the Skeller menu. Harry Frank Neideigh first arrived at the Skeller in 1948, and ordered two pony bottles of Rolling Rock. Several years later, Harry became an employee. He has never left, and can be found perched upon his signature stool at the bar everyday. Click to read Harry’s entire story. In 1955, Harry, a.k.a. “Spaghetti” or “Coach”, began working at the Skeller. In 1958, Doggie Alexander sold the Rathskeller to Dean Smith of Potter’s Mills, who became “Dean” of the Skeller. He instituted the real “Dean’s” list for the everyday patrons, and conducted a much different school of learning. His picture can be found at the end of the bar by the men’s room. 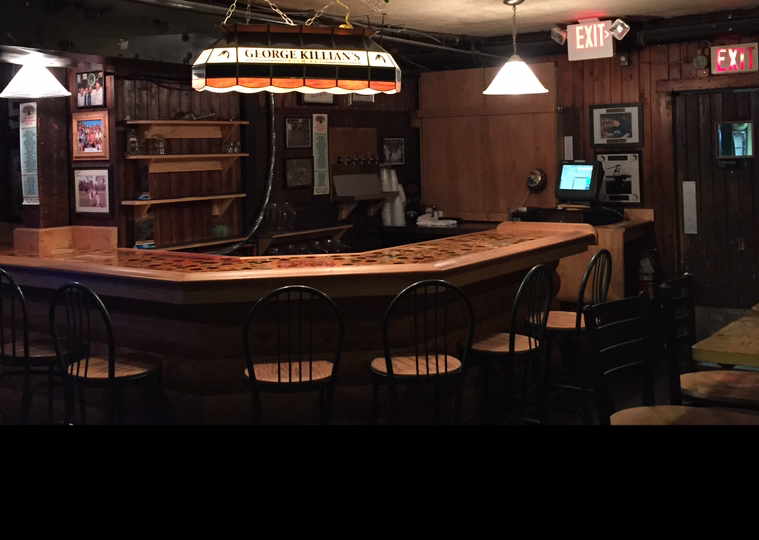 During the early 60′s, the Skeller expanded into the back room, and added the back bar. The back bar originally sat where the band stage is today. Once the bar was moved, the stage became an early stomping ground for several of State College’s original and successful bands. In 1965, Doggie Alexander passed away, leaving behind him smiling photos, unmatchable memories and tons of friends. At the end of the night, when the last of the staff locks the doors, you will often hear them whisper, “Goodnight, Doggie.” In fond remembrance. Then in 1966, the Pennsylvania State Congress passed a law, thirty-three years after the repeal of Prohibition, allowing the sale of liquor in public taverns. The 1970′s marked the arrival of two Skeller bartenders, Bo and Rabbit. They still show up faithfully for all of the home Penn State football games. From the time Rolling Rock ponies were sold at the Skeller until 1972, it was customary to order them two at a time. Then on a football weekend, a customer, after numerous trips to the bar asked owner Dean Smith if he could just buy a case instead. Dean sold him a case for $4, and so began the tradition of Rock cases at the Skeller. It is always interesting to ask long time customers of the Skeller, what they used to pay for cases. Also during this decade, two unknowing future Skeller owners gained employment, Fast Eddie and Duke. In 1980, John Patrick O’Connell, a.k.a. “Johnny O”, bought the Rathskeller from Dean Smith. Not only did John perfect the “Case Study” during his tenure, he also set an unbeatable record which earned its way into The Guinness Book of World Records. On November 9, 1983, John decided to throw an anniversary party to celebrate fifty years of Skeller tradition. “Come on down early,” John said, “we’ll try to set a case drinking record.” Little did he know his customers would pack the bar by noon. At 2:00am, the case sales had reached 903, beating the existing record, held by a bar in Germany, by over 200 cases. And so, the case races began. In 1986, ownership changed once again. The Skeller was purchased by Duke Gastiger and “Fast” Eddie Hill, both former “Skeller Rats”. In 1988, Duke and Eddie bought the Old Main Restaurant above the Skeller and renamed it Spats Cafe & Speakeasy. 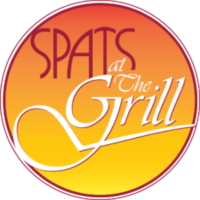 The Skeller kitchen was dismantled and lunches were prepared in the Spats kitchen. In the 1990′s, “Case Day” broke the record three times. The record reached 943 in 1991, 1003 in 1993 and in 1996 reached the 1053 mark, which stills stands. In 1993, Fast Eddie sold his interest to Duke, and is now the owner of the Mount Nittany Inn atop Centre Hall Mountain. In 1994, sadness hit the Skeller once again with the passing of former owner “Johnny O”, who is now included with Doggie in our goodnight wishes upon the locking of the door. In 1996, the Skeller became completely computerized. The old fashion cash registers were replaced by touch screen monitors. Drastic efforts have been made to clean up the Skeller without disturbing any of the original artifacts. After all, the greatest part of the Rathskeller is being able to return to an unchanged tradition which spans the better part of a century. The early 2000’s saw the final case race and a 75th anniversary celebration. The 2010’s began with remodeling of the back bar, bathrooms, and most recently, the patio. All renovations were carefully considerate of tradition and customer comfort. Seasonal outdoor gatherings are a highlight of the newly remodeled patio.